When the week is getting progressively more hectic, and you’re left wishing you were back in play school just so you could get summer vacation, you know it’s time to get you some ‘me-time’. And what better way to destress and chill than pampering yourself at a spa. With these great spas in your neighbourhood, you don’t even have to travel much, and be left with more time to spoil yourself. Go forth and spa. Whether it is jet lag after a long draining flight, a cramped back from long hours in front of a screen or stress from having to multitask constantly, this spa has a therapy to deal with all of your problems. Their signature Swedish Deep Tissue massage works wonders on body pain, stiffness and fatigue. You could also pamper your skin for 60 minutes with a de-tanning Coffee and Cane scrub and polish followed by a sea weed body wrap. At the end of the session, look forward to a refreshing cup of green tea. If you go on weekdays, you get INR 200 off on a 60 minute session and INR 300 off on a 90 minute session. You could also invest INR 15000 on a prepaid card for a year and get all therapies at half price. This premier luxury spa and salon offers you the perfect way to relax with their Swedish oil massage followed by an exfoliating steam session. They also offer a dry Thai massage for 45 minutes, and a hot stone massage that will relieve pain in your deep muscles amongst many other options. Their offers include INR 2,500 for any two-hour massage and for INR 5,000, you get four massages, as and when you like. Wintergreen oil is supposedly famous for relieving pain, tension, irritation and improving blood circulation. With this in mind, you must try the Wintergreen Pain Relief massage at Oryza, followed by hot compresses, all in one hour for just INR 2,400. They’re also good for their nourishing cream massage. After your much needed spa therapy, head to their salon and get some cool nail extensions for 20 per cent off and get waxed at 25 cent off. Sounds like a perfect spa day, doesn’t it? When you’re feeling blue all week and could use some royal treatment, get yourself a luxurious Cleopatra massage at Charisma. A relaxing deep tissue massage followed by a body scrub and polish, a milk bath (doing wonders to your skin) and some time in the Jacuzzi is going to keep you good for a while. If this is too over-the-top for you, you could try any of the 16 body treatments they offer, including Lomo-Lomo, an aroma therapy massage with a combination of oils. Head to this spa on weekdays for a 10 per cent discount and get a Swedish or Aroma massage for 60 minutes followed by a bath for 15 minutes, without burning a hole in your pocket. You could also try their Balinese massage if you can take some heavy pressure. As one of Asia’s largest day spa chains with a knack for customer service, rejuvenate with a blend of technique and relaxation at this spa either in Forum Value Mall or the Grand Mercure Hotel in Koramangala. They specialise in the Aroma Therapy Massage with five different customised oils chosen as per your requirements. This massage for 60 minutes would cost you about INR 3,800 and for 90 minutes about INR 5,450. 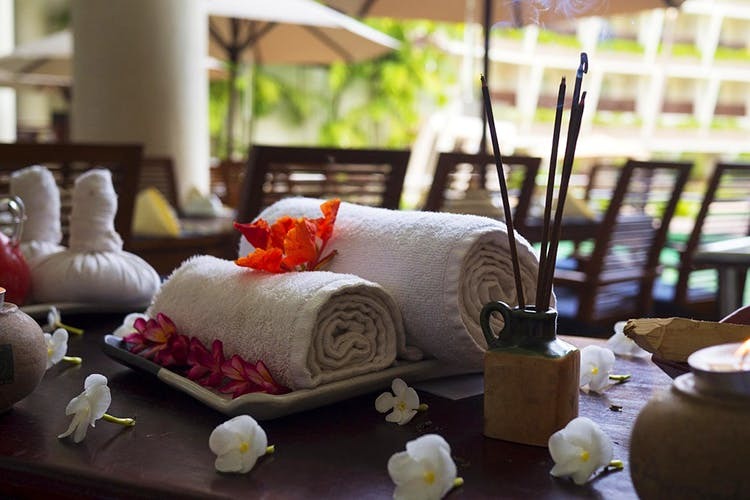 They also offer Swedish, Balinese, Thai, Ayurvedic and deep therapy options. Also, on a 60-minute aroma therapy massage, get some O2 handmade products worth INR 750 for free.